Tiamo 2 has recently undergone an extensive renovation and their downstairs dining area is now a lot more spacious, in the main part due to the fact that they have taken over the shop space next door. While a range of antipasto is still on display, diners no longer have to squeeze quite so tightly behind its late-night perusers to get to a table. The new interior features a lot of dark wood and red tones - the red being mainly employed in the various subtle ways they have incorporated their heart logo into the fitout. They've refined the choice of main dishes, but also now have a dedicated pizza-making area in the reclaimed space. There were some tempting pizza specials on offer, but it's a dish that had featured a few too many times in recent days to make it feel 'special' enough to order. Instead maccheroni della zia got the nod: pasta with mini meatballs, eggplant, napoli sauce & basil. 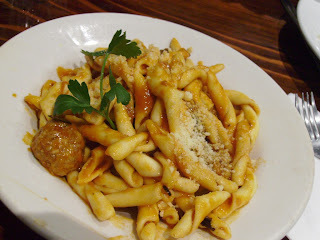 The eggplant was not a particularly strong presence; the napoli sauce was delicate and clung to the pasta, which I was particularly impressed with. The basil and meatballs partnered one another well, the sweetness of the herb contrasting against the slightly peppery rounds of meat. It's always pleasant to experience a carb-and-meat dish that doesn't sit too heavily. SG's choice was the chicken florentino special. 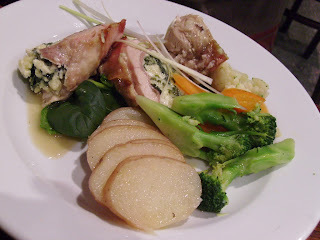 Fillets of chicken, bracketed by bacon, had been rolled around ricotta and spinach and baked in a white wine sauce. The chicken had retained plenty of moisture, so was quite succulent and against the softness of the cheese and saltiness of the bacon a mouthful became quite decadent. It was accompanied by a fine range of al dente vegetables and some suitably oily, seasoned sliced potatoes. We experienced very helpful service, the staff perhaps being spurred on to offer friendliness to the diners by the fact that there was quite a loud, vocal, bell-slamming conflict going on between them and the kitchen staff! One minor point: the restaurant also features an interesting toilet arrangement - one door, three cubicles, two marked for women and one for men.